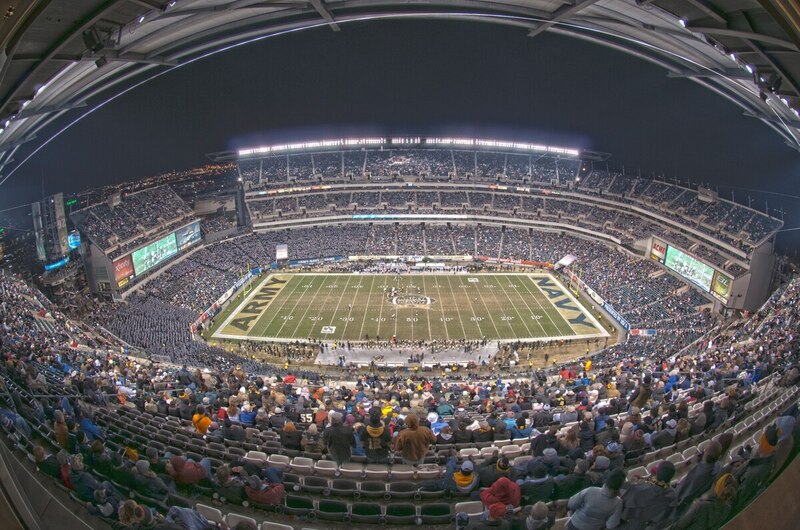 The 2010 Army-Navy football game played at Lincoln Financial Field in Philidelphia, 12/11/2010. Recent rivalry history, and the graduation of Navy's star quarterback, did little to sway Las Vegas oddsmakers. The Golden Nugget sportsbook made the Midshipmen 12.5-point favorites in this year's Army-Navy contest, set for Dec. 10 in Baltimore, as part of the casino's annual summertime release of betting lines for high-profile college football games. It's only a half-point less than the early line set the last two seasons; Navy won both those rivalry games to extend its record-setting win streak over Army West Point to 14, but did so by scores of 21-17 and 17-10 — not enough to cover the double-digit spreads. Four of the last five Army-Navy contests have been decided by seven points or less, with Navy's 34-7 win in 2013 the only outlier. Navy will go for win No. 15 over the Black Knights without Keenan Reynolds, who started at quarterback in the last four rivalry wins and is attempting to earn a roster spot with the Baltimore Ravens as a wide receiver. Reynolds received special permission from the Navy and Defense Department to defer his service commitment to pursue his NFL career. The Mids earned a postseason bowl berth in each of Reynolds' four seasons. Army West Point last played in a bowl in 2010 and is 6-18 under Jeff Monken, who is entering his third season as head coach of the Black Knights. The sportsbook installed the Mids as 13.5-point underdogs to Notre Dame in their Nov. 5 showdown in Jacksonville, Florida. No other games involving service academies made the list of 100 "games of the year," released July 8.